If you are looking for a sturdy organizer that can fit inside your car or in your garage as a storage for all your car and mechanical tools, then you have stumbled on the right page! 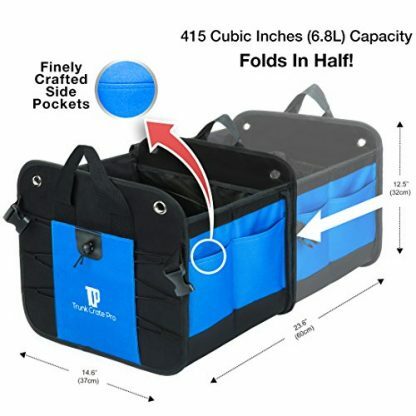 This portable multi-compartment organizer is strong and sturdy enough to store and carry all your essentials in one organized place! Going on a roadtrip or long drives is a great way to unwind and experience new places. However, you have to make sure that you have packed all the essentials for such a long trip. Aside from the basics such as food, water, clothes, and toiletries, you should not also forget to bring along car tools and accessories that are useful in case a busted tire or malfunction happens along the way. These tools and accessories could be many, and most of them would be either small or bulky. To avoid losing or disorganizing them in the backseat, you needs this cargo organizer from Trunk Crate Pro! 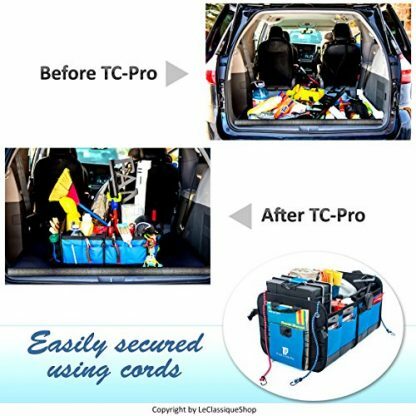 Trunk Crate Pro (TC-Pro) is a professional grade Heavy Duty Material organizer that helps you organize and store car tools, accessories, and other stuff you want to bring along! 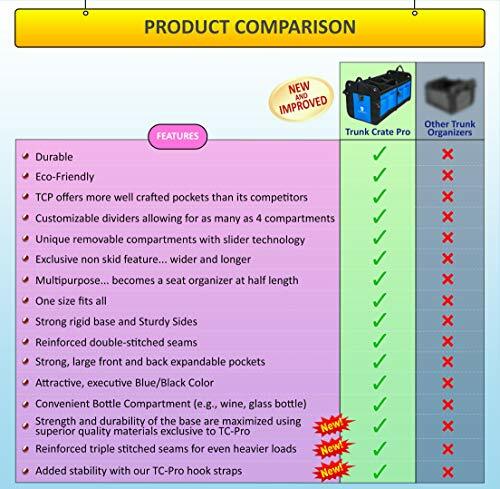 The Trunk Crate Pro (TC-Pro) is a professional grade Heavy Duty Material organizer. It is hand crafted using premium quality Oxford Polyester material. DURABLE – BUILT TOUGH to withstand wear and tear of vehicle use. Your car trunk organizer is manufactured with the strongest and most durable Oxford polyester fabric which can withstand the heavy use and pass the test of time. 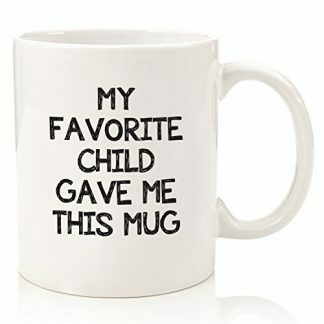 It is water resistant and abrasion resistant. Features reinforced stitching on areas that receive the most wear. This particular material is waterproof material makes this organizer not only durable, but easy to clean. 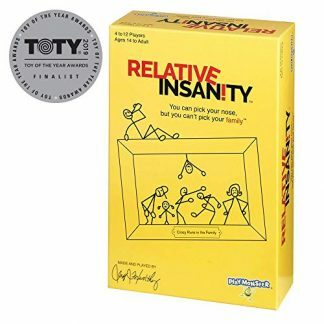 USABILITY – EASY TO USE AND INSTALL. Gone are the days of a messy car. 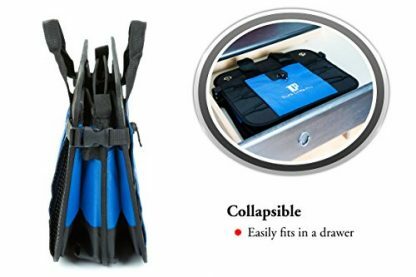 Simply unfold and load any items you desire. 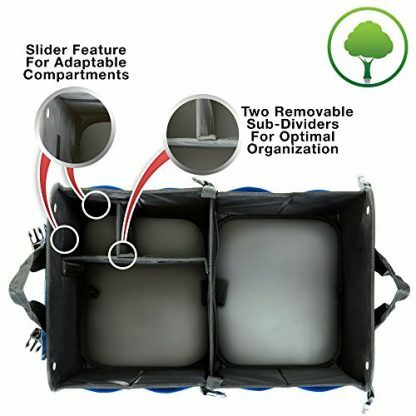 One of the largest and most effective backseat organizer on the market. It has a clip and hold sub-divider, a middle sub-divider, rigid base plates and center that allows you to stay organized in your vehicle. 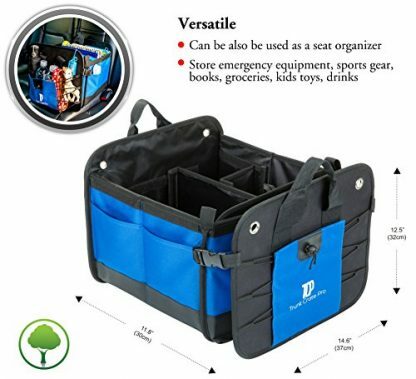 With its well-constructed design, the organizer stays firm without any cargo in it. INNOVATIVE DESIGN AND MULTI-FACETED DESIGN – The cargo storage container was designed and invented after months of testing and sampling with the best factories. 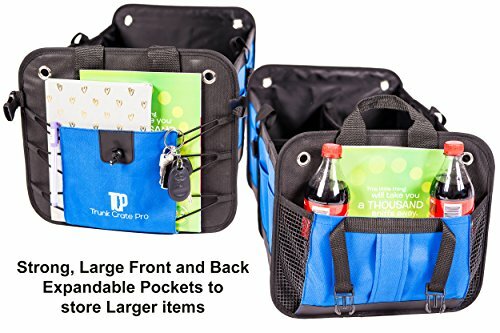 Has 11 pockets in total to store smaller things – 2 large quality pockets, 8 Fabric pockets and 1 mesh pocket give you plenty of extra storage space. DIMENSIONS: When open, the size is 23.5″ (60 cm) * 15″ (37 cm)* 12 inches (12.5 cm); When folded in half, the size is 14.6″ by 12.25″ by 1.5″. Universal Fit – Fits all vehicles (truck, SUV, Van, or Car). 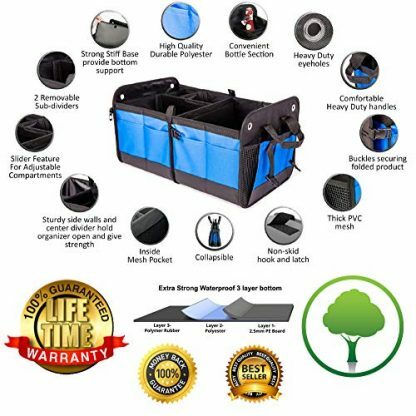 LIFETIME GUARANTEE – Our unique product comes with a LIFETIME guarantee during the LIFETIME OF YOUR TRUNK ORGANIZER. 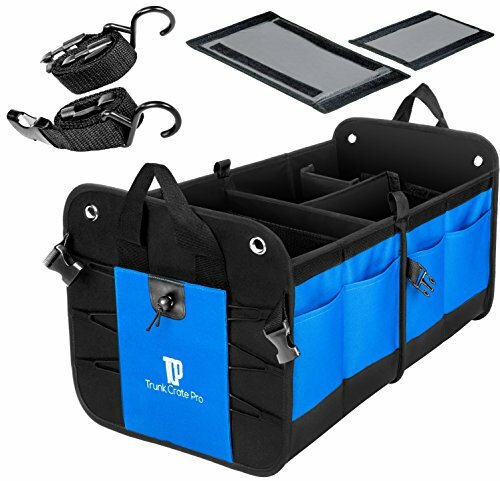 This trunk organizer is easy to use and carry, making it perfect even for rush or unplanned trips! 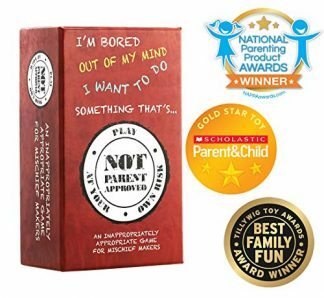 This is a great gift for friends and family members who are fond of out of town trips, summer camps, and picnics.